alaTest ha raccolto ed analizzato 51 recensioni su Remington MS5120. La media della valutazione per questo prodotto è 3.9/5, confrontata con la media della valutazione di 4.3/5 per altri prodotti. Abbiamo analizzato differenti valutazioni di esperti ed utenti, età del prodotto ed altri elementi. A confronto con altri prodotti, Remington MS5120 ha ottenuto un alaScore™ complessivo di 85/100 = qualità Molto buono. I cannot review as purchased as a present. For someone living abroad. A replacement for old (like for like) for my husband. Very good product. 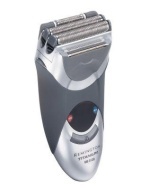 Purchased this product as I previously had a Remington I an very disappointed in the cheap cord you are now using to cut costs,it keeps getting tangled up in knots I prefer the coil type used on previous shavers. Remington has always been a strong performer for me. The Boots price point gives extraordinary vale for this product and click and collect service is faultless. Perfect timing for a bargain. My husband had had one previously and left it on holiday, panic we needed a new one and here it was at a great price. If you are thinking ahead get one fir Christmas presents the man in your life will be happy. Husband says ' Pleased with the result but care needs to be taken when replacing the foils over the cutters after cleaning'. An information leaflet would have been helpful.